It isn't too hard to tell that this is a sandpiper of some kind, and judging by the short legs and bill a small sandpiper at that. We can also see that our quiz bird has black legs, so all of the small sandpipers with yellow or green legs can be eliminated right away. Of the small sandpipers with black legs, Curlew Sandpiper and Dunlin have bills that are longer and slightly decurved, whereas the bill of our candidate is fairly short and straight throughout its length. A Sanderling would have a heavier bill and by the middle of May would also show some rufous on the head and upperparts. Our quiz bird completely lacks rufous. The largely brownish plumage might suggest a Semipalmated Sandpiper but a Semi would have folded primaries that fall about even with the end of the tail. Note that the folded primaries of our quiz bird extend well beyond the end of the tail. This same difference applies to Western Sandpiper. Two small black-legged sandpipers have long wings like our quiz bird: White-rumped and Baird's Sandpipers. To separate these two similar species we need to look at the flanks, bill shape and color, and upperpart color. The sides of our quiz bird are spotted, not streaked, and the flanks are unmarked. A White-rumped Sandpiper would have fine streaking on the sides and flanks. Score one for Baird's. The bill of our quiz bird is perfectly straight and completely black. A White-rumped has a bill that is usually slightly drooped at the tip with a reddish base to the lower mandible that contrasts as a paler area. Score two for Baird's. Finally, the upperpart color of our quiz bird lacks any rufous tones. An alternate plumaged White-rumped Sandpiper would have some rufous in the upperparts. Score three for Baird's. 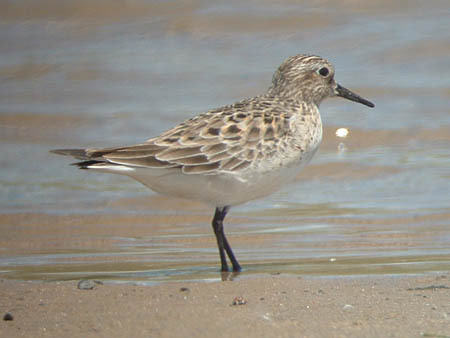 This adult Baird's Sandpiper was photographed on May 14, 2005 at Waukegan Beach in Lake County, Illinois.